Hashtags (#) are on every social media site including Facebook, Twitter, Instagram, Google+ and Tumblr, but what exactly do they mean and how is this marketing strategy going to help reach your target market? As you read on you will learn the different types of hashtags particular to authors, bloggers and public speakers, while seeing examples of how to better target your audience with this strategy. First, let’s get to know the meaning of hashtags. Hashtags are a type of metadata tag that is combined with words or phrases in messages and posted on social networking services to form a unique message or thought specific to an audience. Hashtag messages can have representation for individuals or businesses and help people or users find specific tweets, posts or comments. The group of words combined are then created in tweets, posts or in blogs on several specific thoughts including the topics of books, TV shows, movies, debates, #quotes, celebrities, news, events or other conversations that can be useful or relevant to others on social networking sites. Once this hashtag is formed others can click the link of the hashtag created to view past hashtags of this specific message or thought. Etiquette #1: Create a hashtag relevant to your message. If your hashtag has no relevance to the message it will be considered spamming. So if you’re sending a photo of you and fans at your latest book signing, stay away from a hashtag on the weather, keep the content relevant to your photo or message. Etiquette #3: Take advantage of this marketing opportunity to build your brand. As you create a unique hashtag for your business you are building reputation for your brand. So use this hashtag in everything relevant to your business and every time someone clicks on this hashtag they will pull up all of your past messages, links, photos and content relevant to your brand. This will help gain a better insight of what you talk about, where you go and the credibility of your brand. Etiquette #4: Punctuation marks and spaces are a “no-no” in the hashtag world. Once a space is created the hashtag will end with the word before that space.The same goes for punctuation marks, once these are included the phrase of your hashtag will end with the word before the punctuation. *Side tip: In hashtag world there is no difference with upper and lower case letters, so if you post #HashTagGuru, all other #hashtagguru posts will also come up in searches. Hashtags are a great marketing tool to help build your brand, but also be aware of the success from competitors’ hashtags as well, to help you gain attention of consumers and where the talk is at in particular to your industry. Authors have a great opportunity to market their readers by incorporating hashtags in their tweets on Twitter or posts on Facebook. Connecting with other authors, reading groups, book clubs and of course, fans. These hashtags create inspiration to many authors as well, building new ideas and virtually sharing their interests with other fans and peers. Bloggers really need to take advantage of this tool on social media platforms like Twitter. This marketing tool can reach hundreds of consumers each hour, so tweet to your fans and gain followers with a hashtag relevant to other bloggers or consumers and your blogs. This is the highest hashtag for a blogger. The average tweets per hour using this hashtag is 130 to 700. The peak of this hashtag is on the weekdays between 4AM and 1PM EST. However, because this hashtag is so common, your tweets might not be as noticed. Still, include the (#) when referencing your blog as you will gain the attention and build credibility as a blogger. Again, the ‘s’ brings the traffic down. Still receiving good quality tweets and hashtags, however not as many as #Blogger. This hashtag was created by @MarkCollier and typically runs every Sunday at 8pm CT. You can find #Blogchat on other days and times by searching this hashtag and comparing which discussion you want to participate in that day. Every Monday post your blog with this hashtag to gain the attention of other bloggers posting or consumers looking for fresh new content. Public speakers can definitely take advantage of hashtags to reference their upcoming event or topic they will be speaking about at a conference. These hashtags should include cities, locations, topics, business and other keywords that will attract an audience to your speaking event. Include the following hashtags as week, for consumers to know your specialty and if you’re the opening act or a keynote speaker. Now, you are ready to go out into the social networking world and properly use these hashtags to reach your target market. 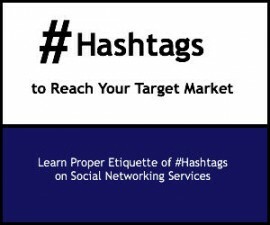 Continue to look over the etiquettes of hashtags as you market the right audience and build your brand. Thanks for including #SpeakingofWealth hashtag when referencing this helpful marketing blog!